Generally speaking, MXF, the abbreviation of Material Exchange Format, is a complicated container format for professional digital video and audio media defined by set of SMPTE standards. The file extension of MXF file is ".mxf". According to official report, MXF format was designed to address a number of problems with non-professional formats originally. As for many advantages brought by MXF, most of camcorders adopt it as the shooting format for better storage video and audio. Though this video format is much more widely used than ever before, many people also have many concerns about how to play MXF files on general video players or mobile device as most of them don't support it. And in many cases, the MXF files cannot be processed correctly by common Mac MXF converter programs. Because the video and audio are stored separately in different file folders and you must find a very professional one which has ability to transfer MXF files. 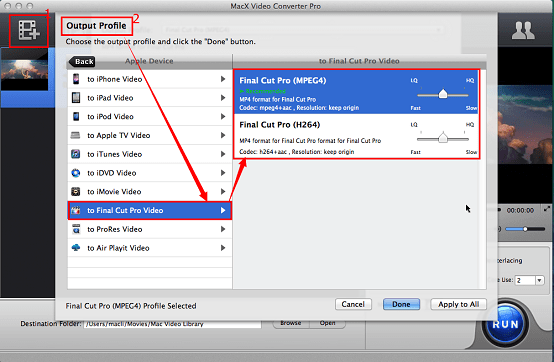 Designed especially for Mac users, MacX Video Converter Pro provides the best solution to easily convert any video to over 180 video formats and 14 popular audio formats on Mac OS X, for example, convert MXF to MP4, MOV, M4V, AVI, FLV, MPEG, WMV, etc. With 420 preset profiles, the MXF converter Mac allows you to freely transfer MXF files to lots of mobile devices like iPhone iPad, Sony, Microsoft, Huawei, Samsung, Google, Blackberry, PSP, PS4, Xbox One, etc. With the assistance of hyper-threading technology and multi-core CPU use, you can finish the whole converting process within several minutes. Attention Please：Before you begin to convert, make sure that you have completed the installation of MXF converter for Mac. And if you are a Windows OS user, the Windows version could be the best choice for you. Launch MXF video converter for Mac and load the MXF video file by clicking the button of "Add Files". Choose the output video format in the "Output Profile" dialog box. There are all kinds of video formats and portable devices for your consideration. If you want to convert it to MP4 for Final Cut Pro, you can find it in Apple Device category. Click "Browse" to select the destination folder to save the target output files. Hit the "RUN" button to start converting MXF files. All the tasks will be transferred at fast speed and high output quality. Besides the ability of converting to various video formats and devices, MXF converter for Mac also is capable of editing video by trimming, merging, cropping, adding subtitle and so on. The advanced functions like make slideshow, record screen movement and download YouTube HD video are favored by converter users.